To many organizations, culture is merely an idea developed by executive management and engraved in the boardroom. At AmeriBen, our culture is a pursuit that is engraved in the hearts and minds of each employee. Within our walls, it is considered in every decision and discussed often. We believe that this endeavor will not only improve the overall satisfaction of our employees' experience, but also their relationships with family, business associates, friends, and the community. AmeriBen's culture is one of our greatest marketplace differentiators. We take great pride in developing our AmeriBen family (staff members) and everything we do centers around our culture. First and foremost, our Core Purpose is: Changing lives by developing great leaders in family, business, community, and the world. Our Core Purpose is a pursuit that is engraved in the hearts and minds of our AmeriBen family. Within our walls, we not only speak of it, but we are expected to have it memorized and exhibited through our day-to-day behavior. We seek to improve the lives of our employees so they, in turn, are better able to improve the lives of those they associate with, including the clients we serve. Although our Core Purpose derives from social and moral obligations, experience has shown that furthering our Core Purpose and living our Values heightens the quality of service we deliver. Our focus on this Core Purpose has been, and will continue to be, instrumental to our long-term success. Not only are these essential to each individual staff member's success, but also our success as a company. We believe that committing to these Core Values will not only result in better employees, but also better mothers, fathers, step-mothers, step-fathers, grandmothers, grandfathers, aunts, uncles, siblings, friends, neighbors, and community members. We value the pursuit of knowledge and have embraced the idea that work is one of the only places where we get paid to get an education. Upon further inspection of our personal rights, we can see that our rights are also our responsibilities. At AmeriBen, we believe that rights are earned and are not an entitlement. Our company's "Bill of Rights and Responsibilities" clearly outlines what our employees can expect if they work here as well as what is expected of them. Adherence to these rights and responsibilities is critical in understanding and living the AmeriBen culture. The right to be trusted and the responsibility to be trustworthy. The right to be respected and the responsibility to be respectful. The right to be developed and the responsibility to develop others and yourself. The right to be engaged in the AmeriBen community and the responsibility to engage. The right to a safe work environment and the responsibility to create a safe work environment. Every employee is charged with delivering ACT quality work to our clients and their plan participants, whether it is through claims processing, eligibility assistance, creating reports, responding to phone inquiries, or sending out claim reimbursements. Happiness is key to success in "family, business, community, and the world." While most companies' wellness programs focus solely on physical wellness we believe this is only a small part of the picture. AmeriBen believes an employee's overall happiness will be affected by the balance of the following five areas of life: social, emotional, physical, financial, and career/educational. As we attain strength in these areas, we shall achieve true "happiness." 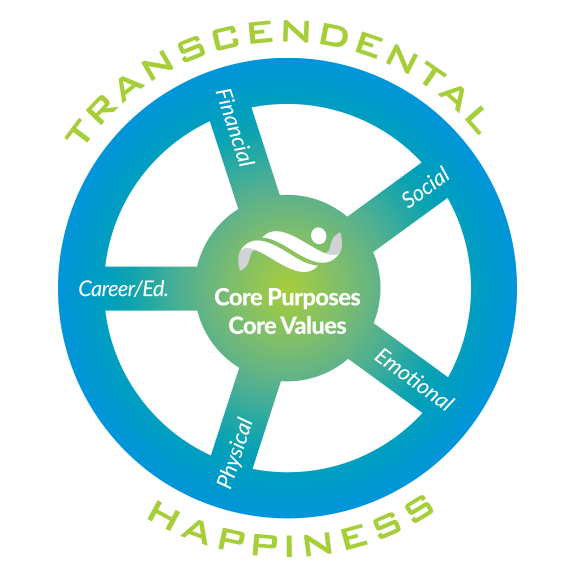 As a company, we openly talk about the five "spokes" on the transcendental happiness wheel and give our employees opportunities to engage in various activities on a regular basis to promote that holistic health. A few of these activities include community service events, financial counseling, healthy living education and support, career and education services, and emotional support resources. Have you ever tried to ride a bike with a flat tire? If you have, it was undoubtedly rough and an unpleasant experience. Not to mention, a journey with an unbalanced wheel usually takes additional time and effort to reach your final destination. Finding transcendental happiness means a tire full of air and a balanced wheel for a smooth ride. This philosophy of balance has resonated with our staff over the years. One of our members recently said, "What determines the smoothness of the ride of life may not be as much about the bumpiness of the road, but more about the roundness of your wheel." A wheel with strong and long spokes forming a perfectly round circle is our goal and, as Gallup researchers have found, the workplace is where the greatest impact on these elements can occur. Why "have to" go to work, when you can "get to" go to work? As a company that trusts our employees, we encourage our team to make real-time decisions. 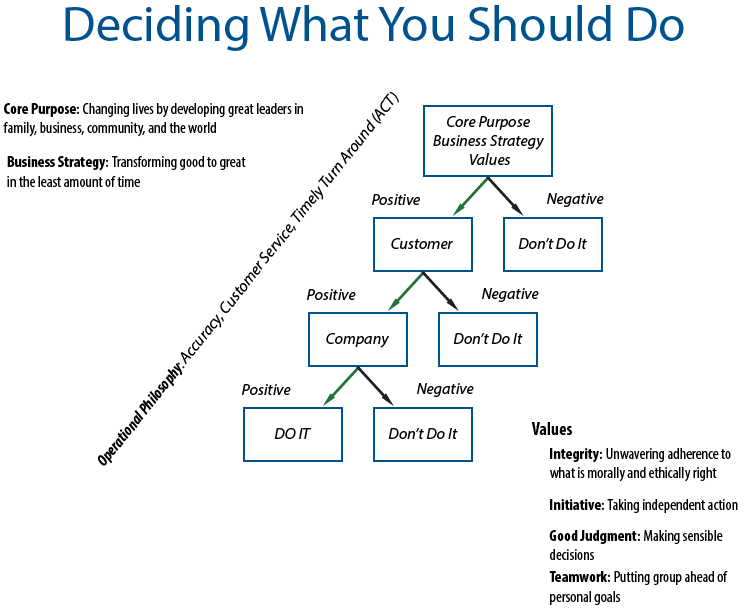 Our Decision Tree guides employees through the decision-making process by helping them analyze the impact of their choices and how those decisions relate to our Core Purpose, Core Values, and Operational Philosophy. 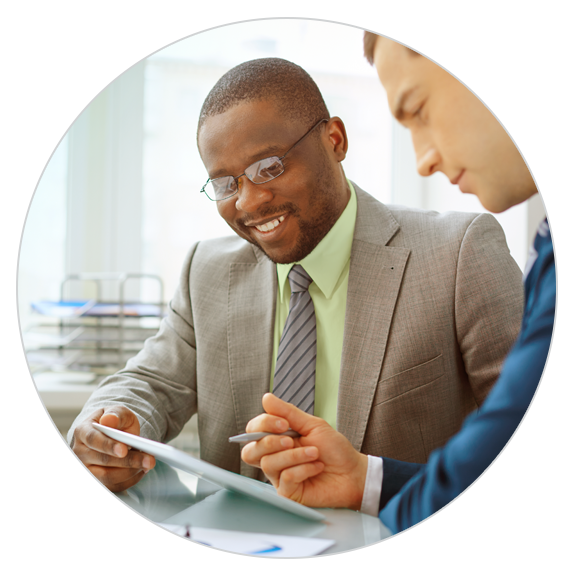 This tool allows a team member to critically examine their decisions and truly do what is best for AmeriBen as well as our clients and members. Is the decision adhering to our Core Purpose, Values, and Business Strategy? After successfully analyzing a situation with the Decision Tree, we have full confidence that decisions made by any AmeriBen staff member will be positive and beneficial for all parties involved. Our Core Purpose, "Changing Lives by developing great leaders in family, business, community, and the world," commits us to developing the leadership skills of our team. We recognize that leadership is a frame of mind rather than just a title one holds, so we strive to enhance the leadership skills of our entire team. The wide range of style, format, and depth of development opportunities allows our staff a number of avenues for engaging in leadership training. We are committed to giving our employees the opportunity to develop and grow with us, and we expect them to embrace the opportunity! Each year AmeriBen's CEO, Andy Fujimoto, organizes a four-month Leadership Development course with the purpose of further developing strong leaders in family, business, community, and the world. The course discusses different leadership techniques and styles, reviews general business knowledge including legal aspects of hiring, terminating, discipline, and basic accounting principles. The course is aimed at making each person take a step back and examine where they are in their development and the steps they need to take to make their aspirations a reality. This may mean learning how to recognize and interact with someone who has a different work style, how to present in front of groups, or how to appropriately delegate.